Life is not about making an income, but about making an impact. As one of the many passionate community members from Windermere Secondary School in Vancouver, Christal has learnt that “kindness” is not simply a word, but an act of friendship. She is beyond thankful for the opportunities she’s had to transform her passion for giving into true impact. Through serving and leading neighbourhood initiatives, she’s learnt how although one action may not change the world, it still has the potential to change the world for one person. Thus, Christal has harboured this concept in the volunteer work she has contributed. At age 13, Christal began to credit the Tzu Chi Foundation for teaching her the values of compassion and love for others. As she distributed parcels with her dad and other Tzu Chi volunteers at a food bank, she quickly realized how much volunteering had an impact on her–learning to give without asking for a return, and being filled with gratitude for the chance to give back. 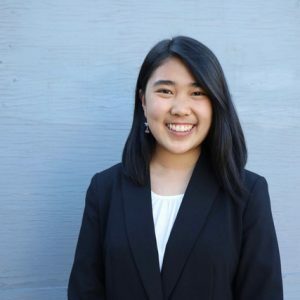 Today, Christal devotes her time to its youth branch, the Tzu Chi Collegiate Youth Association, where the chapter collectively plans events for homeless shelter and senior care visits, soup kitchens, environmental sustainability projects, and more. During her Winter Break of 2017, Christal also volunteered with the organization at the Tzu Chi Hospital in Hualien County, Taiwan. In July 2017, Christal travelled on a ME-to-WE service trip to Kenya, where she rolled up her sleeves and helped to construct a schoolhouse for Kipsongol Primary School in the Maasai Mara. She strongly believes that distance and time should not be obstacles to giving back. Therefore, when she returned home, Christal served as a board director in her WE Schools club, working alongside her team to raise money to improve access to education in Africa. “Friendship” is a language that can’t be spoken or touched, but a personal wish for others to be happy. A wish for family, friends, or the world we call home. A wish that can only transpire into reality through action. Christal believes that youth and adults alike have the power to carry out the act of friendship—a form of kindness with the gift of compassionate giving; regardless of image, form, or distance. All in all, she is incredibly honoured to be the recipient of the 2018 Nadine Marshall Memorial Scholarship, and would like to express gratitude to the Kindness Foundation for their support.